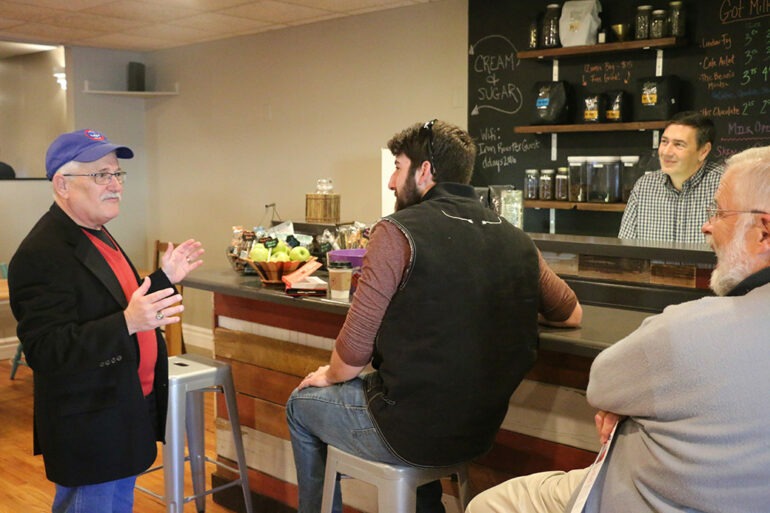 Whether it was talking to patrons at The Bean coffee shop downtown or going door to door in an apartment building on the other side of Vermillion in the days leading up to last night’s election, Mark Winegar stopped and talked to anyone that would listen in the waning days of his campaign. The Democratic candidate for District 17 House of Representative said he called more than 4,000 homes this election season and knocked on an uncountable amount of doors. Winegar said being his own treasurer and campaign manager has its advantages though. “The advantage of that is that if I go out canvassing I can canvass as long as I want. If I want to take time to talk to a particular person who’s got some issues I can take all of the time I want so that’s an advantage. Next time — and win or lose there will be a next time — I’ll do that a little differently,” he said. The district chair of the Democratic Party ran against three other candidates for two open positions. The two incumbents, Democrat Ray Ring and Republican Nancy Rasmussen, both said that running for office this year was only slightly easier than the first time they ran. “I think I have a better idea of what I’m doing, yeah. It’s just as time consuming and tiring as the other two times…,” Ring said. Rasmussen said the fair in Turner County helped make campaigning easier for her, as well as the fact that she knows many people in the area. For Debbie Pease, a graduate of USD and a first-time political candidate, this election saw her participate in multiple parades from the time she announced her candidacy. Running for local office doesn’t just require hours upon hours of campaigning though. It also requires thousands of dollars in funding for signs, buttons and other campaign material. Ring, a former economics professor at USD, said he designed his own ads this year and recorded his own radio spots. In total he spent between $12,000 to $14,000 on his campaign. Rasmussen said she spent between $15,000 to $16,000 and Pease said she had also fundraised about $10,000. “(The) state party told me I needed $35,000 to win this district and I’m going to win it on $8,000. There’s too much money in politics,” said Winegar. Winegar said during the election he tried to focus on getting young people to vote. He also said regardless of whether or not they voted in this election, USD students should exercise their right to vote in future elections. “I don’t care how you vote, but vote,” he said.